Here’s a WIP of a digital toy I’m working on, that allows you to interact with cubes up to 15x15x15 ( click on the Options icon in the bottom right, then move the slider and press the button - an Ad should appear ). 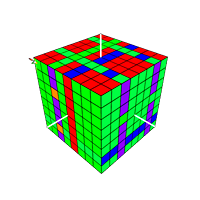 Create and use cubes of different sizes! Let me know if it works for you, and if you see the ad ( or not ) when you set the cube size to be greater than 3. Works fine for me. I do find the controls and instructions a bit counter-intuitive. For instance the layers rotate horizontally just by clicking but you need to use a drag “gesture” to do a vertical rotation. The ad displayed, but the length of that ad is super-annoying. I think you’d be better off annoying the users with more frequent shorter ads than one long one. But that’s just my gut feel on it. Oh - one more interesting thing that you may already be aware of. When I open that link on a browser where I’m logged into Facebook on our studio account, I don’t go to the game but go to our studio account instead. On a different browser where I’m logged into my personal account, I go directly to the game. This looks like an intentional re-direct from Facebook. The controls are something I’ve got on the list to fix. I’m not sure if I can specify the length of ads, I’ll check into it though. Since the start of the year, I try to get two days a week to spend on a few PlayCanvas projects - most of that time has been spent working around issues in Playcanvas ( mainly due to not having visual access to the hierarchy in an imported FBX ) and reporting bugs ( most of which seem to get ignored ). The PlayCanvas development team need to have a more visible presence in these forums - maybe have each dev take an hour every other day, and go through them to see if they can help. Yaustar does an excellent job, as do some other developers, but the actual PlayCanvas dev team need to be doing this ( or hire a support engineer ). A lot of times, they seem to only post after someone complains. Have an actual Bugs category, which could prioritize what your devs have to look at ( and could act as a triage for engine bugs reported to GitHub ). This could also serve as a place to report UI bugs - the GitHub repo seems for engine problems only. Maybe have an AMA every few so often, to help increase customer engagement? I’ve had a PlayCanvas account for ages, but never considered used it for projects for a long time as I assumed it was too slow on iOS, due to the published link being broken on iOS. I also recently gave a one day PlayCanvas course about a month ago to about 10 artists, one of the first things I do is show how quickly users can publish their content and see it on their mobile phones. On top of learning everything else, I then had to also tell the artists how to edit the published URL to include the /e, as it was of course showing the issues ( broken loading, bad aspect ratio, slow FPS ). Half of them had iOS devices, and most of them wanted to send the link to friends who had iOS devices - having to explain that this was currently broken, was reported, and would hopefully be fixed soon, is a step I’d rather not have to add. Update the WebVR polyfill - quite a few people have asked for this, and have reported issues with the camera shaking ( due to radians / degrees change ) in Chrome. *If this is a quick fix, can this be prioritized - or is there a reason why it hasn’t been done? If you need examples of any of the above, just let me know. Just to wrap up on the original question about writing a tutorial - a) I’m not sure if I’m doing it the right way, I want to try a few different methods to strealine the process, b) Up until now, four days game development takes me a month, due to trying to work around bugs etc, so I don’t have any spare time. c) It would totally make sense for one of your team to spend time doing this. If a tutorial had existed, it would have saved me about 8 days ( two months for me ). I just updated the FB Instant Game to be able to share your screenshot. I’m going to try to extend this, so that when you share the link, it’ll share your currently scrambled cube, which can then be solved by anyone clicking on the link. Great project! Is inspiration for new developers.